The world-wide famous Bauhaus movement was founded exactly a hundred years ago in Weimar. This is a lifetime process which had lead its principles spread out to various cities all over the world. It has influenced the style, attitude, and vision of us, and of some who haven’t even noticed since Bauhaus has been a part of our lives. Bauhaus was established by Walter Gropius in 1919 that also marks the founding of the Weimar Republic. Both anniversaries are crucial for the history and contemporary character of Weimar. Therefore, 2019 is devoted to being the year of the celebrations especially in Berlin, Dessau, and Weimar—the major cities for the existence of the Bauhaus. Art exhibitions, performances, talks, education projects, tours and many more will be organized in both public and private areas. Some of them have already started, some are planned for an interval between 2017-2020, and many of them are going to be added to the calendar in time. One of the biggest news of all is the three new museums that are going to be built in Berlin, Dessau, and Weimar. They will be offering unprecedented experiences and rediscovering uncovered details of the Bauhaus. The key feature of the new locations will be their distinguished architecture, and all the stories behind their emergence will be connected through a common language and various events. 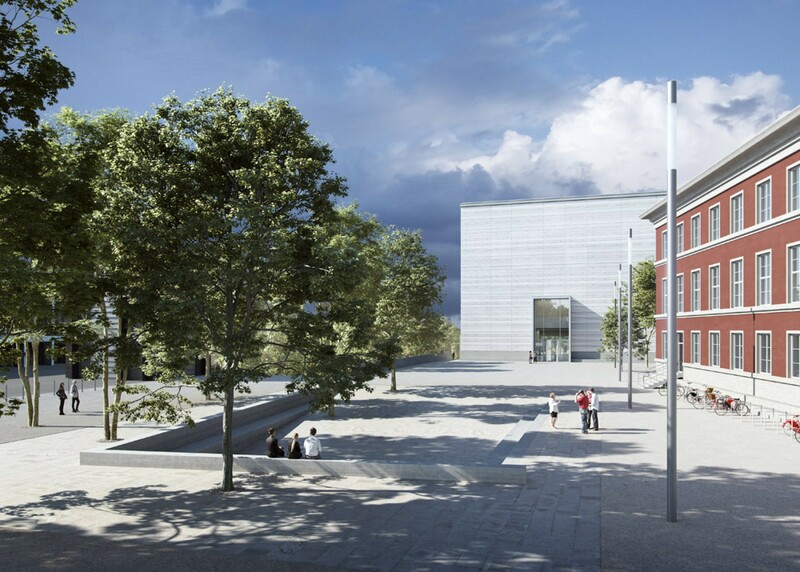 The new museum building in Weimar is planned to be finished by the end of 2018 so that it can be inaugurated during all the memorialization events. An architectural competition was organized in order to find the suited design ideas and Prof. Heike Hanada from Berlin was commissioned out of more than 500 participants. What he plans for the construction is to create a glass-made cubic form resting upon a concrete sole. The opaque façade will hide the sense of different stories and turn into a whole piece of material. There will be two entrances from both sides that will create a vivid flow through-out the building. The main idea behind the project is to create a cultural focal point as a bridge in-between past, present, and future by gathering both historical and memorial sites of Weimar. Since the New Bauhaus Museum is on the way, the former one is permanently closed. There will be a colorful party to say goodbye to its location on Theaterplatz on 17 February between 3 PM – 10 PM. Music, art, and dance performances will be held by New Bauhauskapelle, Bahadir Hamdemir, Artist group RGB, Thuringian Dance Academy. Also, Bauhaus workshops, food, and drinks will be offered. The exhibition by Klassik Stiftung Weimar is planned to be held at the new building of Bauhaus Museum Weimar. From April until June 2019, it will be highlighting the history of Bauhaus and explore the role of Weimar. Bauhausstudio 100 is an extraordinary Bauhaus exhibition on the occasion of the 100th anniversary of the Bauhaus. The exhibition celebrates 100 actors in 100 days – artists, designers, architects, civil engineers, performance artists, and musicians. The exhibition will present and unite the work of alumni and those currently studying at contemporary design institutions that see themselves in the tradition of the Bauhaus. The Studio 100 exhibition will be accompanied by readings and manifestos, podium lectures and performances, for which the small Bauhausbühne will be launched. In the buildup to the project, the LAB_Studio100 will be launched for both scientific discussions and artistic and performative experiments. Weimar section of the exhibition will be held in collaboration with Kunsthalle Harry Graf Kessler, Gaswerk Design and Project Workshop Weimar, Neufert-Box Gelmeroda, and Bauhaus Atelier. Studio 100 encourages people from all around the world to take place and come to join them in Weimar. The selected works (will be a hundred of them) should show a multifaceted and heterogeneous picture of the new Bauhaus that we have experienced and live through together: a Bauhaus of departure and the avant-garde, a Bauhaus which is not simply a style, a digital Bauhaus with its interdisciplinary experiments and ambiguous attitudes, a Bauhaus between province and Internet, project and party, pixels and polygons in which the role model established by the original Bauhaus is reflected and broken a thousand times. The projects can be submitted until April 10, 2018. Conditions of participation can be found here. “The World Sees Bauhaus” is a photo campaign founded and run by the centenary program “100 years of Bauhaus”. The main idea is to reflect your own perspective about Bauhaus through the pre-made stencils and then post them on social media with #bauhaus100. The attendees are asked to share their reflections by taking photos focusing on Bauhaus’s influences on today’s architecture, art, and design. The stencils called 100-stencil can be found in the museum-shops, or on request at Bauhaus Dessau, the Bauhaus-Archiv in Berlin, the Bauhaus Museum Weimar or other Bauhaus sites. There also the opportunity to download it online for the DIY lovers. The purpose of the project is to collect a variety of different images under one tag and choose the best ones to share on Facebook, Instagram, or Twitter accounts. Under the theme of “100 Years of Communism”, this years’ Kunstfest Weimar will be hosting public art projects, theater and dance performances, concerts, exhibitions, readings, conversations, and movies. At the occasion of the 100th anniversary of the Bauhaus, “Heat Cold Devices” programme will be held in Weimar including a wide range of events. Originally created by the students of Bauhaus-Universität Weimar, the Bauhaus Walking Tour project is an extremely successful and integral part of Weimar’s cultural landscape. The tour guides, all of whom are prospective architects, civil engineers, cultural scholars or artists, show visitors what it means to them to study, learn, live and have fun at this unique university with its eventful history. The visitors are taken to the historic Bauhaus sites where they can relive the past and present of the university area. On the occasion of the 100th anniversary of the founding of the Bauhaus in 2019, the Bauhaus-Universität Weimar intends to produce a centenary publication reflecting the thought and action at the international, interdisciplinary university. University members and alumni are invited to submit contributions for the publication. Formats are sought that are suitable for pointed presentation of the respective topic and can be published in a print publication. Possibilities include essays, interviews, photo series, sketches, artistic contributions, model visualizations, reflections, and documentaries; opinion pieces are also welcome. A compelling book is to be created to enable outside observers to access the Bauhaus- Universität Weimar on an intellectual level in an entertaining manner. Applicants should submit their projects by February 15, 2018. More information can be found here. Haus am Horn located in Weimar is one of the great examples of Bauhaus architecture. It was built for the Bauhaus’ Werkschau exhibition by Georg Muche. Originally, Walter Gropius had planned to design it himself, but his designs fell through when he asked his students for their opinion. The building is currently closed until a further notice due to the preparations for the Bauhaus anniversary in 2019. Guided tours for groups are possible according to state of the art care investigations and work on request. The exhibition makes the argument that the significant driver behind many of the creative spaces and methods worldwide was the playful culture of the Bauhaus. It begins in the Bauhaus “Haus am Horn”. Designed as a touring exhibition, the project will start its schedule in Germany, and continue in various countries in Europe and the United States. The Bauhaus in Pictures (Das Bauhaus in Bildern) will be a showcase of almost 200 pictures both from Weimar and Dessau times. This comprehensive photographic documentation will testify the life and work at the Bauhaus in both major cities for the movement. The collection will include works of the famous Bauhaus photographer Erich Consemüller (1902–1957). The exhibition that will take place in Schillers Museum Weimar can be visited for three months starting from March 24, 2018.